MULTI-SPECIES BONUS – 35.5″ FLATHEAD! WHO I FISHED WITH: This past Tuesday morning I fished with Steve Thomas and Jim Johnson, both retirees living in Georgetown, TX. Most of their local fishing experience came in the form of fishing shallow, visible cover for largemouth bass on Lake Georgetown. Their desire was to enjoy a blend of quality and quantity while learning tactics for fishing deep, clear water to help them expand their repertoire on their home lake. 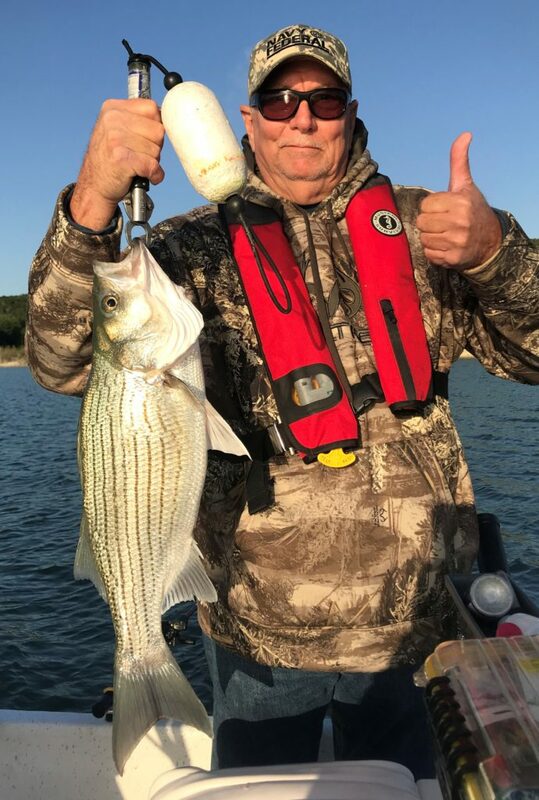 We fished for hybrid with live bait for 2.5 hours, then left the remaining 1.5+ hours for the pursuit of white bass using artificial lures. As the white bass we were vertically jigging for stirred up a little commotion, this flathead (yellow) catfish came in for a look and got a bit too curious about Jim’s slab. 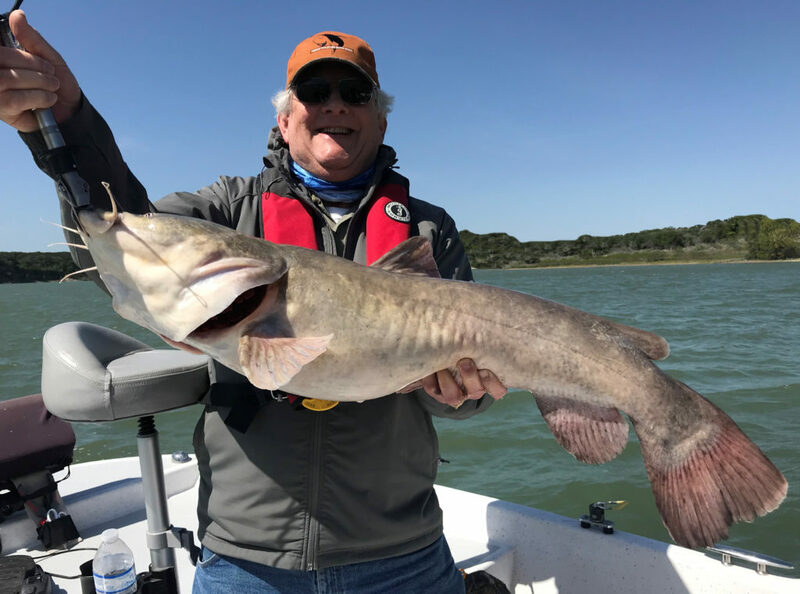 After a lengthy battle on the Fenwick Eagle medium light spinning rod he was using for the white bass work, we brought this 35.5 inch catfish to net and released it promptly after a few photos. Steve with one of the many hybrid we took on live shad this morning. The fish showed a definite preference for threadfin shad over gizzards this morning. Along with the hybrid, we also encountered white bass, largemouth bass, crappie, blue cat, and drum. WHAT WE FISHED FOR: This was a multi-species trip. HOW WE FISHED: We fished at just one location this morning with live shad, then changed over after 2.5 hours of that to vertically jigging for white bass using a smoking tactic, primarily for white bass that were actively feeding at the top of the lower third of the water column under very windy conditions. 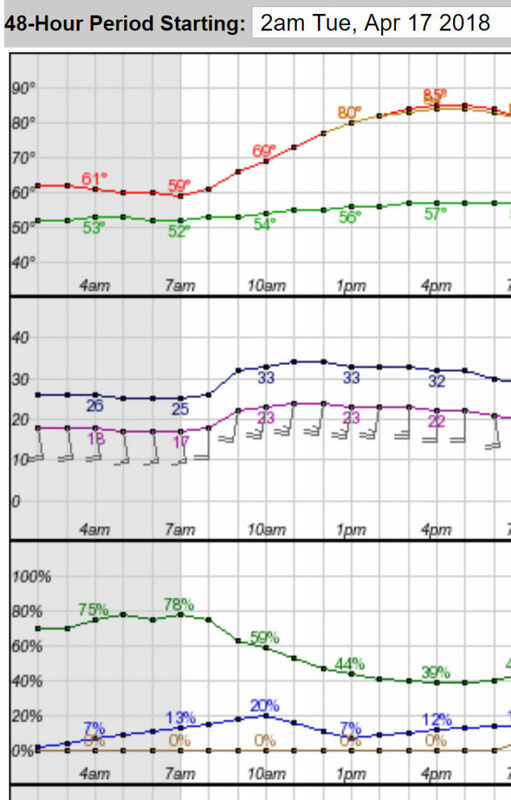 OBSERVATIONS/NOTES: 1) The surface temperature exceeded 65.3 for the first time in over two weeks and as it did, the threadfin shad began to spawn once again allowing for “one & done” netting. Sky Conditions: Cloudless blue skies.